It may not seem like it was all that long ago that a bashful and nervous Ronan Parke first stepped out on that stage on the hit show, ‘Britain’s Got Talent’…but it’s been longer than you thought! Time goes by so FAST when you’re having fun, I guess! Hehehe! I remember watching this for the first time, and thinking that Ronan was going to shake himself to pieces in front of everybody, and his big television debut was going to end up being a traumatic experience that would haunt him the rest of his days. But he took a deep breath, greeted the judges with a boyish smile…and once the music started, he simply came alive! Not only was his voice much bigger than anything I could have expected out of someone so small, but Nina Simone’s “I Feel Good” is one of my all time favorite songs. Like…ever. So kudos to Ronan for knocking that one out of the park on his first time out! But don’t take my word for it. See for yourself! Needless to say, at only 1 years old, young Ronan Parke made quite an impact on the world at large, and fans immediately began looking for what he’d be getting into next! Born in Poringland, Norfolk, in the UK…Ronan is about a month and a half younger than the Shack Out Back website itself! Hehehe, geez! It’s weird to say that! Now 20 years old, it’s crazy to see how much he’s grown and how much he’s accomplished since he first started. Even after taking some time off for school and just living life outside of the spotlight for a while. I think that one of the hardest things for a singer to do is truly ’emote’ with their singing voice. Singers can hit perfect pitch, give us flawless runs, and have a vocal range that is out of this world…but if you can’t bring some real emotion to what you’re singing and move the people who are listening to you? The most talented voices in the world can end up falling on deaf ears where the public is concerned. I always felt that Ronan excelled in putting his heart and his feelings into every word when he was singing. It’s easy to tell that his talent really comes from somewhere. I can appreciate that. And so can his biggest supporters. Fans who have been sticking by him from the very beginning, and are happy to continue doing so to this day. Due to Ronan’s age and good looks, the timing of his rise to popularity got sucked into the vortex of the ‘Bieber-Fever’ pop stardom that studio execs were looking to duplicate and mass produce at any and all costs. Nothing wrong with the Justin Bieber mold…but that was never Ronan’s particular place in the industry, in my opinion. He always excelled at being himself. ‘Take me as I am’, you know? Again…something else to be appreciated about an artist who believes in what they want to do with their music and its influence on the people listening to it. It’s hard to say. Ronan Parke started off with an EP of covers, including a playful remake of Vanessa Carlton’s song, “1000 Miles”. He began performing live, as well as making youtube videos where he covered more songs that would showcase his voice to an ever growing fanbase. Then, after a few more songs were released…came the single, “Move”. Now, I don’t have any problems with the song itself…but as cool as it was, I never felt like it ‘fit’ him. Hehehe, especially since it begins with a really cute boy getting ready to go out to a club that Ronan happened to be at during that time! WHAT??? YOU watch that video and tell me that you didn’t immediately think that boy was getting ready to meet Ronan at that club and pull him on the dance floor with him! Hehehe! That’s not just my imagination here! Anyway…again…this was during a time in pop music where Justin Bieber, Cody Simpson, and One Direction, was what everybody was looking for to sell albums. But Ronan was an original, and I’m glad he decided to keep his heart, despite the pressure to conform with everything else that was going on at the time. 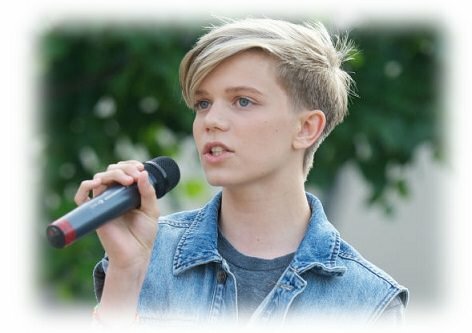 When Ronan Parke returned to the music scene, his newest single, “Defined”, was done for charity, and tackled the theme of teenage bullying. A song more his speed, and sung with all the sincerity and emotion that fans had come to expect from him. Bullying is something that Ronan has admitted to experiencing on his own, growing up, especially since finding fame, and this song signaled a return to the expressive, heartfelt, tone that we all had come to know and love about him in the first place. He seemed to be trying, valiantly, to find a foothold in the music biz…but they never really gave him the chance I think that he deserved. It happens, sometimes. Since then, I’m glad that Ronan has enjoyed his hiatus from the industry, but I’m also glad that he can’t help but to be drawn back to what he loves…much to all of our benefits! The world could use a voice like his. So why not? I’m sure that we’ve got much more to look forward to from this talented young adult, and I can’t wait to see what’s in store for him in the near future! Good to see you back at work, dude! Ronan Parke’s newest album was released just a WEEK ago! It’s called “Found My Way”, and it shouldn’t be hard to find at all if you go looking for it! Support him and his music if you can, and let’s see this shimmering star get the shine that he’s earned by following his dream for all these years! Now, he’s never once been ‘public’ or said anything directly about his sexuality…and let’s be honest, it’s really not important. He is who he is, and that’s enough for me. But…if he DOES turn out to be even a little bit gay in the future??? Hehehe, I think a Ronan Parke, Greyson Chance, Troye Sivan, tour would be IMMACULATE!!! Just saying!